I whipped this baby up in 20 -30 mins. The frame is from Walmart. I removed the glass and saved it in a closet. I cut burlap to size, and with a wet rub on glue, I glued and smoothed down the burlap. Mod Podge would work too, just let dry. 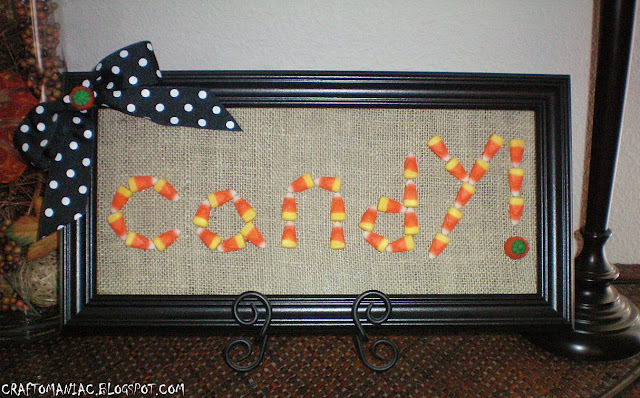 Next, I laid out my candy corn on the burlap, just how I wanted it. Then one by one glued them on. 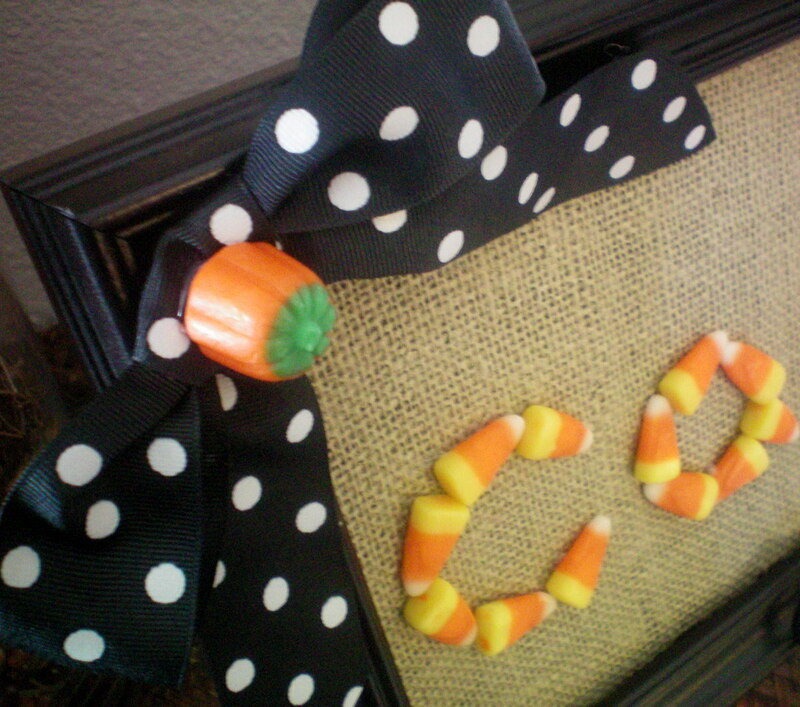 Lastly I tied a bow and hot glued that in the corner with a pumpkin candy corn. I am linking up with Domestically Speaking for Count Down to Fall Party HERE and Making The World Cuter Monday HERE All Things Related for Anything Related Party HERE AND Tatertotos and jello for Jens Weekend Wrap Up Party HERE. Super cute idea thanks for sharing! so flippin’ cute!! 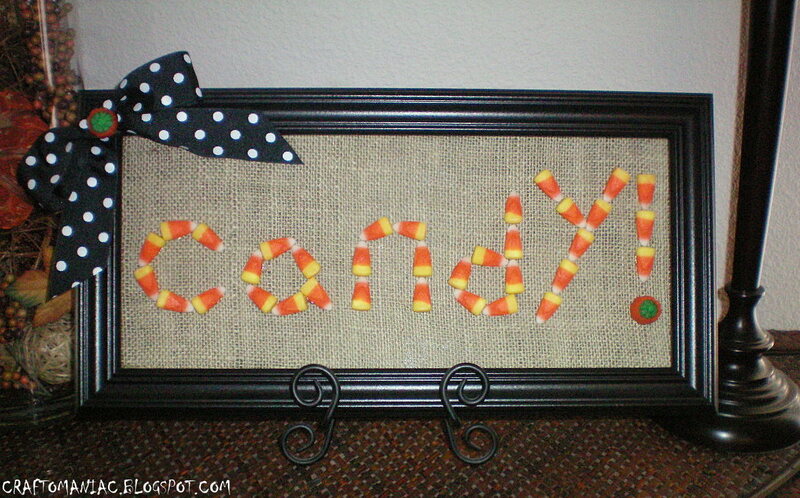 Attaching the candy corn to the burlap is the only way to keep me from eating it!! Very cute idea, thanks for sharing! I think the Y being larger adds a little creepiness to it. If that is a word! great use for all my leftover corn from last year. This is adorable!! 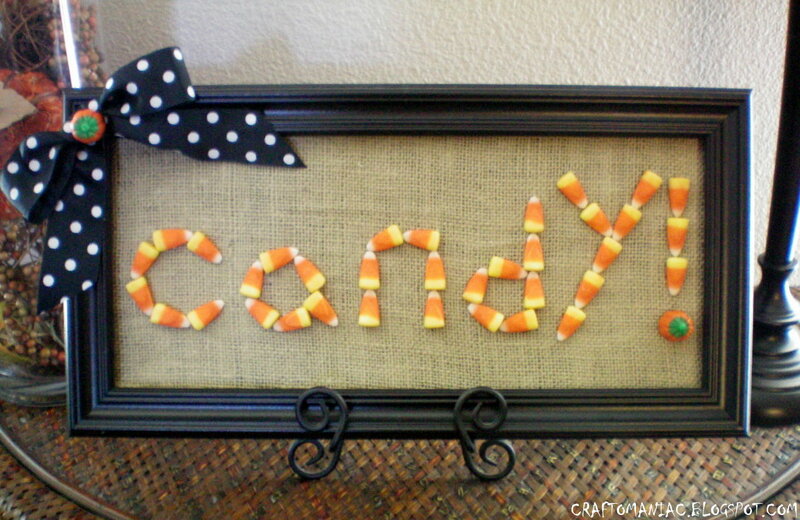 I love it and I LOVE Candy corn! Great combo!! very sweet idea!! 🙂 I like that the y is kooky! Its adds to the Halloween theme. 🙂 Although im like you.. had I made it myself… I prolly wouldnt be happy with it either! hehe. Thanks for the idea its super cute! I like the idea of the Y looking Kooky.. after all, Halloween is all about kooky and creepy right? I think its great. I love this idea! It looks fantastic. Nice work! Supercute!! 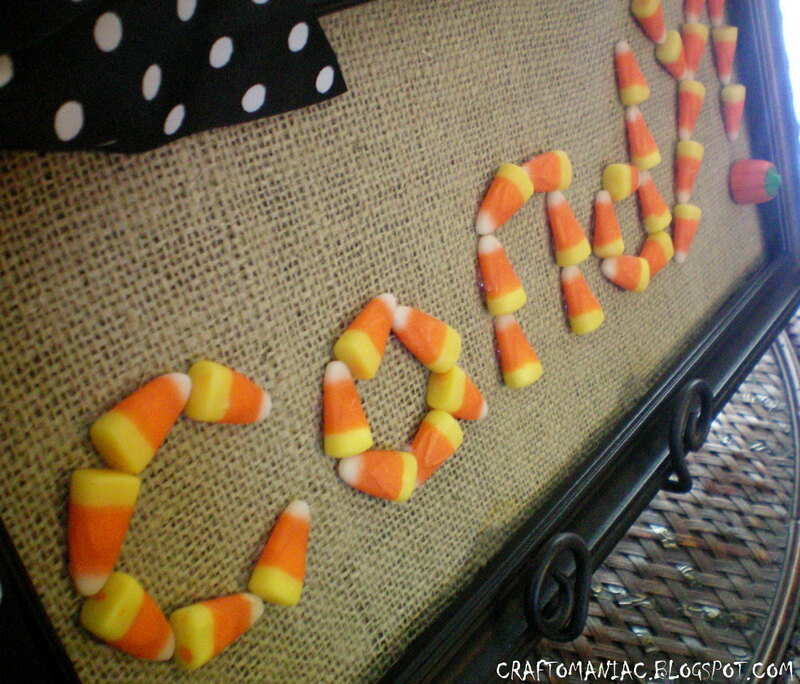 If I made that, I know Evan would try to eat the candy corn..lol!! Do you have to keep an eye on your lil man from eating it? THIS is super duper cute!!! That really is a cute idea! Love your ideas! I’m new to your blog and stopping in via “Making the World Cuter”, but I’m positive I’ll be by daily! My daughter would flip over this frame! She loves everything candy corny! It is so cute! I love it! I also love the frames from WalMart too, you can’t beat the price! Thanks for visiting my site, Jen. I am honored that you would ask me to link up my wreath because I just love your ideas and site! I will link it up now. CUTE! And clever, good for you!! I think it is adorable! My immediate reaction a smile, I didn’t notice they Y at all! Shut the front door! I totally love that. Although my 4 year old would most certainly eat them glue and all. That is so adorable. You are on a Halloween kick girlfriend! P.S. Did you know you have word verification on? This is as cute as can be. I love the bow in the corner – the perfect detail. too cute! i know my youngest would be eating the candy corn off of it, glue and all, lol! I think it’s adorable! Thanks for stopping by and sharing your project with us at Anything Related! That is super cute and looks yummy. Great job and way creative. So cute! I like the Y the way it is, it adds to the fun! Do you mind if I feature this on an upcoming Links I Like post? hey there, I just wanted to stop in and let you know that i featured this on my blog. come on by and grab a button to brag about it!